Valley Green Estates is a neighborhood located between Narcissa Road and Township Line Road in Plymouth Township. Thirty-eight single-family houses are in this community. Almost all of the houses are on lots larger than one acre in size. The name of the development comes from the green valley on which the large homes – estates – were built. The land formerly was farmed. The top photograph shows this neighborhood near the intersection of Sparango Lane and Melissa Way. 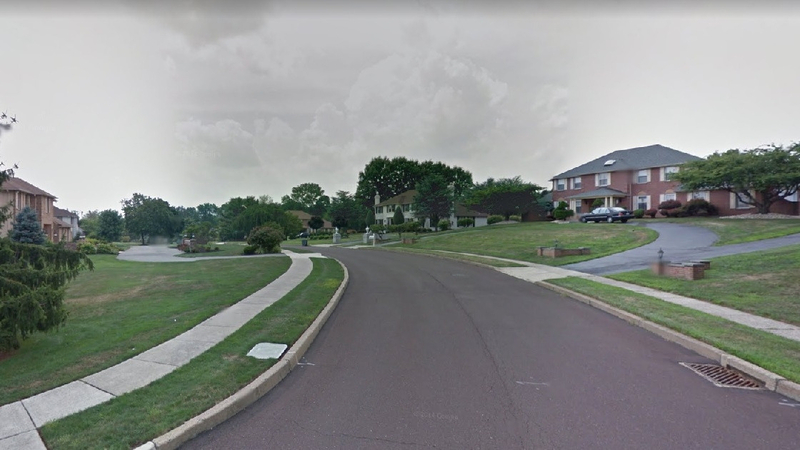 When first developed, houses in Valley Green Estates were being sold for $185,000.00, according to an advertisement dated February 17, 1980, in The Philadelphia Inquirer. Prices varied in the initial years of the development. In a news article in the same newspaper that was dated June 28, 1980, the prices for houses ranged up to $210,000.00. According to a news article dated October 19, 1980, in The Philadelphia Inquirer, starting prices had increased to $197,300.00 to $220,000.00. About one year after opening, Valley Green Estates houses were selling for $245,000.00, according to an advertisement in The Philadelphia Inquirer that was dated March 28, 1981. In 2017, seven houses in Valley Green Estates sold for amounts ranging from $525,000.00 to $800,000.00, while one house sold for $511,000.00 in 2018, according to records of Montgomery County. 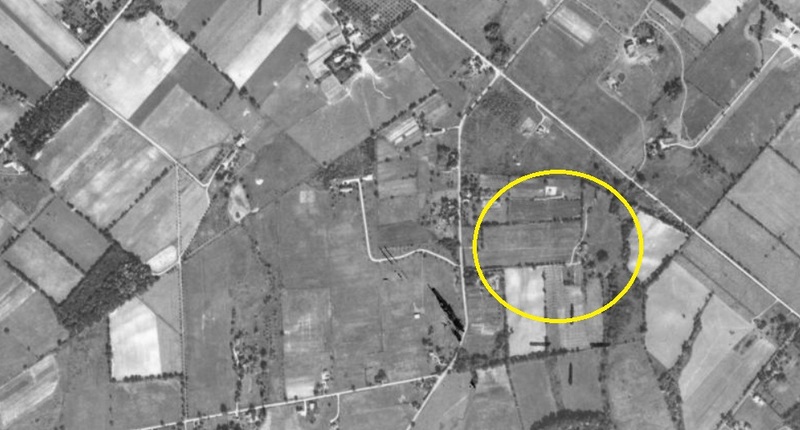 In 1942, this is what the Narcissa area of Plymouth Township looked like from the air. Almost all of the land in this area was being farmed. The future site of Valley Green Estates is highlighted in yellow. Township Line Road, separating Plymouth and Whitpain Townships, is the white line that goes from about the center of the top of the photograph to the lower right-side of the photo. Narcissa Road is the white line that goes from the middle of the bottom of the photograph to the right-side of the top of the photo. Hickory Road is the white line near the bottom of the photograph. 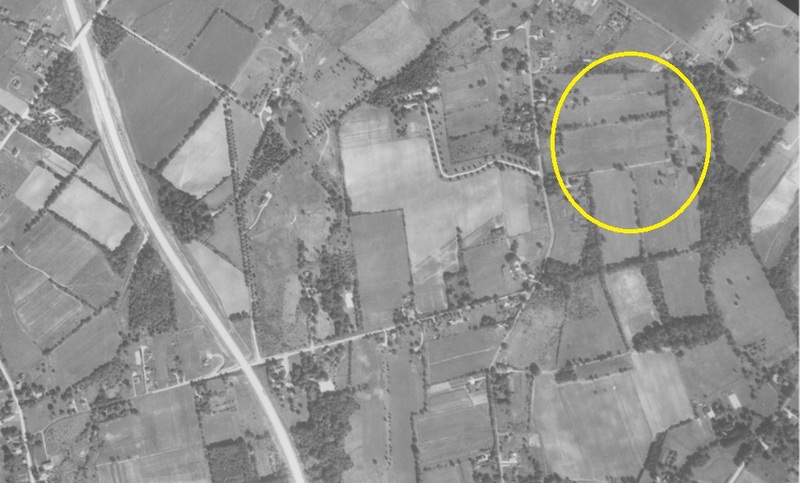 This is what the area of Plymouth Township looked like in 1958. The ground that now includes Valley Green Estates is highlighted in yellow. 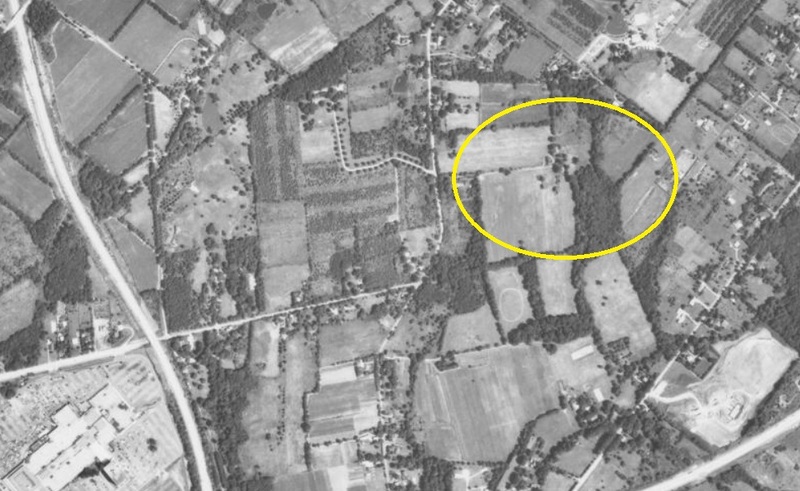 The thicker white line that goes from the top to the bottom to the left of the photograph is the Northeastern Extension of the Pennsylvania Turnpike that had recently been built through the area. By 1971, major developments have started to be built in the areas around Narcissa. While a few houses had been built, almost all of Narcissa, though, still remained as farmland. The Plymouth Meeting Mall is located in the lower left corner of this photograph. There are three streets within Valley Green Estates. All of the streets were named after individuals associated with the developer of this community in the Freedom Valley. 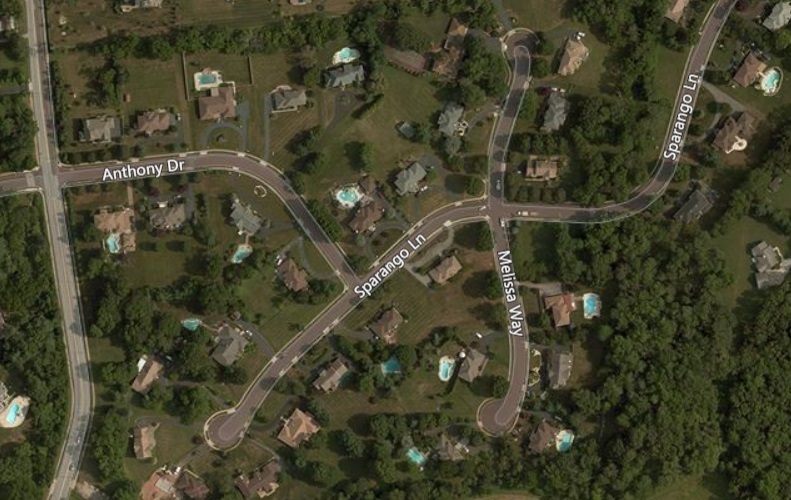 Anthony Drive is named after the first name of a son of Mr. Pat Sparango, the builder who led the construction of this neighborhood. Melissa Way is named after the first name of a niece of Mr. Sparango. Sparango Lane is named after the family of Mr. Sparango. The fourth aerial photograph is courtesy of Bing, 2014.